A Corrosion Inhibitor is a chemical compound that slows down or stops the corrosion (normally rusting) of the metallic parts of a well or drill. In general, a typically effective corrosion inhibitor will provide 95% protection at a concentration of 80 ppm and 90% at a concentration of 40 ppm. One of the methods in which the inhibitor can work is the creation of a passivation layer – that is a thin layer or film on the surface of the material that acts as a barrier between the corrosive substance and the metal. In the oil industry, Corrosion Inhibitors are designed to protect against water, both fresh and brine, biological deposits, carbon dioxide (anaerobic corrosion), hydrogen sulfide and other organic acids associated with drilling in all oil-field types. 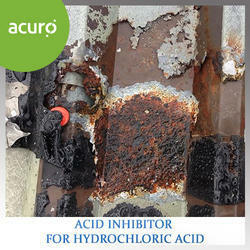 ACURO's Acid Inhibitor for Hydrochloric Acid is an organic, cationic, moderately, foaming, liquid acid inhibitor designed to inhibit the attack of Hydrochloric Acid on Copper, Brass, Iron and steel, during industrial cleaning and pickling operations. ACURO's Acid Inhibitor for HCL is non-toxic and the formulation does not contain Arsenic, Antimony, Cadmium, Lead, Mercury or CFCs. 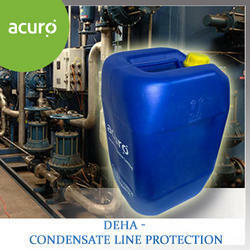 Gives protection to any type of steel, copper, brass upto 120 C.
The addition of Acid Inhibitor to Hydrochloric Acid solution provides maximum protection to equipment during the removal of lime deposits or water scale from plant boilers, piping systems and evaporating equipment, heating and cooling systems. ACUTHERM 3101 is a superior quality DEHA and hydroquinone based boiler water oxygen scavenger and condensate line protection chemical product scientifically formulated for steam boilers and boiler water treatment applications. ACUTHERM 3101 is a volatile liquid, catalyzed solution of diethylhydroxylamine (DEHA). It is used to remove dissolved oxygen from boiler, closed loop, and other industrial waters. It minimizes oxygen pitting and corrosion potential. ACUTHERM 3101 is designed for use in many types of steam or hot water boiler systems.ACUTHERM 3101 provides outstanding protection for boiler systems from oxygen corrosion together with excellent feed water and boiler system passivation.Product Benefits· High performance DEHA based oxygen scavenger for steam and boiler systems· Good condensate line protection· Outstanding protection from oxygen corrosion· Excellent feed-water and boiler system passivation· ACUTHERM 3101 is an all organic formula designed to replace hydrazine as an oxygen scavenger in boiler systems. It is very efficient in its removal of dissolved oxygen from industrial boiler and process water, with reaction times that are substantially faster than hydrazine.· It does not contribute TDS to boiler water. It can easily be controlled by simple analytical procedures.· ACUTHERM 3101 can be used to effectively remove oxygen from steam systems operating at pressures up to 850 psig. 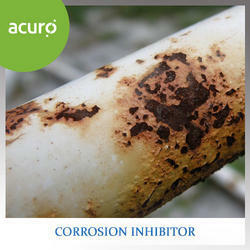 ACURO offers a wide range of Corrosion Inhibitors for diverse industrial applications. ACUROCOR BR83 is a succinic acid semi-ester. Due to its special chemical structure it acts as a particularly effective anticorrosion additive with excellent demulsifying properties. ACUROCOR BR83 can be used as corrosion inhibitor where metal-containing anticorrosion additives are not desired. In industrial oils an effective anticorrosion performance can be obtained with a treatment level as low as 0.3 - 0.5 % by weight. At higher treatment rates of 1.0 - 10.0 % by weight ACUROCOR BR83 can be used for the formulation of rust preventative oils. In these applications the anticorrosion properties of ACUROCOR BR83 exceed the performance of standard calcium or barium sulphonates. Looking for Corrosion Inhibitor ?